Mix together the spices and put on a plate. Add the chicken breasts and distribute the spices evenly over them. Press the spices in and season with salt and pepper. Heat the oil in a frying pan, add the chicken and cook for 2 minutes each side on a high heat. Then fry for 3-4 minutes each side, on a low heat, with a lid on the pan. Test the thickest part of the chicken to make sure it is no longer pink inside. Put the beans in boiling water and simmer for 5 minutes. Put the oil in a frying pan and fry the mushrooms and spring onions for 2 minutes. Add the lentils and lemon juice and cook for 1 minute. Take the pan off the heat and add the tomatoes and the fresh herbs. Mix together. 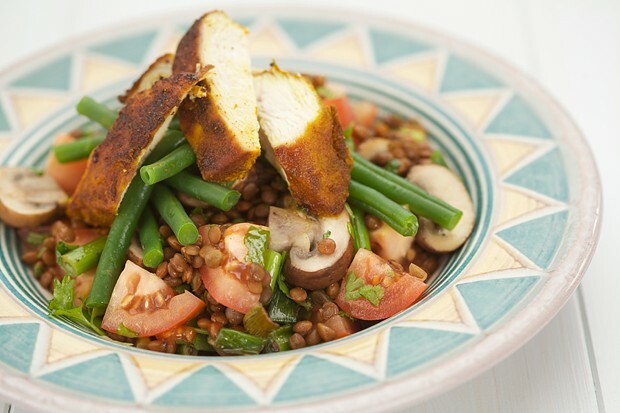 Cut the chicken into slices and serve with the lentil mix and the beans.